Paytm Mall is discovering just how fickle India’s customers really are. After the company had cut back on its cashbacks late last year, the traffic on its website has dropped precipitously. 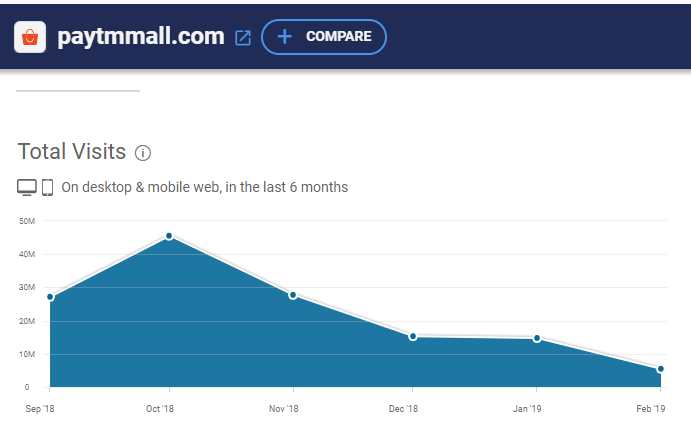 According to SimilarWeb, PaytmMall’s site saw only 5.5 million visits in February 2019. This is a near 90% drop from visits in October last year, when the site had seen 45.5 million users. In December 2018, Paytm Mall had decided rein in the cashbacks that had made its website a popular alternative to Flipkart and Amazon. “We have cut cashbacks across categories. This is part of the plan to… build stronger O2O (or online-to-offline) play, where we are investing big in (2019),” Paytm Mall founder Vijay Shekhar Sharma had said. “We are removing cashbacks from warehouse supplied items and directing them toward physical store supplies. This saves logistics costs and gives us more to share with the consumer and merchant,” he’d added. But customers clearly aren’t impressed, and are voting with their feet. The 90% drop in traffic on Paytm Mall’s site coincides with reports from last month which had said that sales in certain categories, such as groceries, had slumped by 90%. “Sales have dropped by more than 90% in grocery, people are clearly not buying any more. The cashback offer was up to a maximum 35%, but Paytm Mall stopped giving cashback from December 2 as it wanted to be margin-neutral,” one of the largest grocery sellers on Paytm Mall had then said. The move to discontinue cashbacks also appears to have hit sellers on Paytm Mall. “Paytm stopped giving cashbacks and this has resulted in heavy losses for us as consumers have stopped buying. I was doing business worth ₹10 crore a month, but now it has come down to ₹10 lakh. They stopped cashbacks without even informing us,” a seller told Hindu Business Line. Several sellers are also saddled with inventory. “They (Paytm) asked us to stock a month’s inventory for December last year and now asking us to take back the inventory. They have shut the fulfilment centres at several places. We can’t return these unsold inventory back to the manufacturers now,” another said. Estimates say that sellers could be stuck with as much as Rs. 150 crore of unsold inventory, thanks to Paytm Mall’s changed policies. Paytm CEO Vijay Shekhar Sharma, though, maintained that things were going according to plan. “I have mentioned earlier also that we (Paytm Mall) will have a majority business by O2O category. Grocery from our store is becoming bigger and bigger,” he said. He also claimed that the company’s GMV had grown in the intervening period. But with sellers saddled with inventory and customers clearly not visiting the site as much, Paytm Mall appears to be falling away in the race to be India’s top e-commerce brand. Flipkart and Amazon are both flush with cash, and seem determined to win India’s e-commerce race. And as recent developments indicate, Paytm, which also has everything from a payments bank to movie ticket bookings to take care of, appears to be finding it hard to compete.